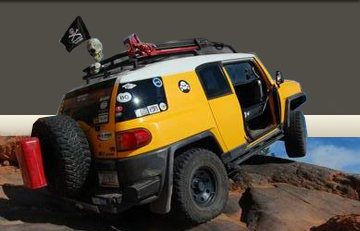 AZFJ › Forums › Arizona FJ Discussion › Classifieds › 4 Tires - Like new Bridgestone 265-70/17 - PRICE REDUCTION!! Forums › Arizona FJ Discussion › Classifieds › 4 Tires - Like new Bridgestone 265-70/17 - PRICE REDUCTION!! 4 Tires - Like new Bridgestone 265-70/17 - PRICE REDUCTION!! Posted: Tue Jan 14, 2014 3:47 pm Post subject: 4 Tires - Like new Bridgestone 265-70/17 - PRICE REDUCTION!! I have 4 like new Bridgestone Dueler HT 265-70/17 tires that I just took off of my new 4Runner. Only 1800 miles on the tires, and they were NEVER wheeled. Only action they saw was pavement and the dirt road going to my house. They are $168 each at Discount Tire, and I'd be willing to part with all 4 of them for .......Buy 3 get one FREE!!! $300 for all 4! I'd also be interested in gun trades, sticker collections, mounted unicorn heads, twerking lessons, or your mom. SWEEEET! Guess we can scratch the twerking lessons off my list of reasonable trades. Guns, stickers, unicorns, and your mom still good to go! Posted: Mon Jan 20, 2014 8:29 am Post subject: Re: 4 Tires - Like new Bridgestone 265-70/17 - PRICE REDUCTION!! Buy 3 get one FREE!!! $300 for all 4 tires! Posted: Thu Jan 23, 2014 8:57 am Post subject: Re: 4 Tires - Like new Bridgestone 265-70/17 - PRICE REDUCTION!! No interest? Dang. I really don't want to deal with the trolls on Craigslist. With Valentines day right around the corner, wouldn't you like to be a hero and surprise your loved one with these great tires??? They're guaranteed to get you good freaky lovin'!!! Posted: Mon Jan 27, 2014 8:52 am Post subject: Re: 4 Tires - Like new Bridgestone 265-70/17 - PRICE REDUCTION!! Link to the exact tires on Bridgestone's website. They claim 198.99 each for these. Posted: Thu Feb 06, 2014 2:41 pm Post subject: Re: 4 Tires - Like new Bridgestone 265-70/17 - PRICE REDUCTION!! Posted: Thu Feb 06, 2014 8:51 pm Post subject: Re: 4 Tires - Like new Bridgestone 265-70/17 - PRICE REDUCTION!! Posted: Fri Feb 07, 2014 8:53 am Post subject: Re: 4 Tires - Like new Bridgestone 265-70/17 - PRICE REDUCTION!! Posted: Fri Feb 07, 2014 12:41 pm Post subject: Re: 4 Tires - Like new Bridgestone 265-70/17 - PRICE REDUCTION!! Posted: Fri Feb 07, 2014 12:47 pm Post subject: Re: 4 Tires - Like new Bridgestone 265-70/17 - PRICE REDUCTION!! Thanks Brian! We'll see how it goes. People on CL act like travelling to the Carefree Hwy is a goddamn expedition lol. Posted: Fri Feb 07, 2014 12:56 pm Post subject: Re: 4 Tires - Like new Bridgestone 265-70/17 - PRICE REDUCTION! !